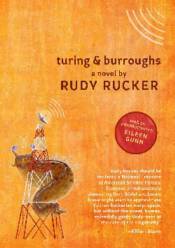 The lives of scientist Alan Turing and author William Burroughs are turned upside down in this off-the-wall sci-fi caper from Rudy Rucker. What if Alan Turing, founder of the modern computer age, faked his suicide to escape assassination by the secret service? What if he then became the lover of Beat author William Burroughs? And what if they then mutated into giant shapeshifting slugs, fled the FBI agents tracking them, raised Burroughs�s wife�killed in a tragic drunken mishap�from the dead, and, finally, tweaked the H-bombs of Los Alamos to use them for a very different purpose? Turing & Burroughs is a wild beatnik adventure: compulsively readable, hysterically funny, with insane warps and twists�and a bad attitude throughout.